The historian al-Masudi writes that on state occasions Zubayda “could scarcely walk under the weight of her jewelry and dresses.” She endowed more charitable works for pilgrims to Makkah than any ruler of her era. From Indonesia to Pakistan, Kyrgyzstan to Nigeria, Senegal to Turkey, it is not particularly rare in our own times for women in Muslim-majority countries to be appointed and elected to high offices—including heads of state. Nor has it ever been. The story of Khayzuran is one of rags to riches, captivity to sovereignty. Born in the southwestern part of the Arabian Peninsula around the middle of the eighth century, a bit more than 100 years after the death of Prophet Muhammad, she was kidnapped by slave traders while still a child. Sometime between 758 and 765, she was sold in Makkah to none other than the founder of Baghdad, Abbasid Caliph al-Mansur, who gave her to his son and successor, al-Mahdi. She bore al-Mahdi a daughter and two sons, both of whom became caliphs—one the renowned Harun al-Rashid. By the time of her death in 789, her annual income had reached 160 million dirhams, which was roughly half of the entire state revenue, according to the 10th-century historian al-Masudi. Her personal wealth made her “undoubtedly, next to [her son Caliph Harun al-Rashid], the richest person in the Moslem world of her day,” observes historian Nabia Abbott, whose Two Queens of Baghdad: Mother and Wife of Harun al-Rashid is a seminal work in Middle Eastern women’s studies. Khayzuran’s path to political power, like that of many women in the long era predating today’s nation-states, was via the royal haram, or women’s quarters. A favorite of al-Mahdi, she enjoyed a level of trust that rivaled, and may have exceeded, that of Rita, al-Mahdi’s first wife and cousin whose origins could not have differed more from Khayuran’s: Rita was a royal, the daughter of Abu Abbas Abdullah, founder of the Abbasid empire. A brief statement in al-Tabari’s monumental, ninth-century History of the Prophets and Kings shows al-Mahdi’s regard for his first lady of the haram: “In this year  al-Mahdi manumitted his slave girl … al-Khayzuran and married her.” At a time when caliphs were expected to marry fellow members of the aristocracy, elevating Khayzuran to queen was “a bold break with convention,” modern historian Hugh Kennedy has observed. And not unsurprisingly, the medieval Arab chronicles indicate that this led to court intrigue: The high-born ladies of the Abbasid court sneered at Khayzuran’s presence, yet she is said to have deflected their snobbery with cordial grace. Though history provides no evidence of direct tension between Rita and Khayzuran, the fact that the latter’s sons—Musa al-Hadi and Harun al-Rashid—were named as heirs to the caliphate while the former’s were never even considered indicates Rita’s “tacit recognition of the futility of challenging” Khayzuran, Abbot speculates. Described as “slender and graceful as a reed,” according to Abbott (khayzuran is Arabic for “reed”), she hardly relied on beauty alone for her success. She was intelligent, freely quoted poetry and studied the Qur’an, hadith (sayings of Prophet Muhammad) and law at the feet of leading scholars. but Zubayda was born into nearly limitless luxury. The story of Khayzuran is one of rags to riches, but Zubayda was born into nearly limitless luxury. She is also said to have enjoyed practical jokes and shared al-Mahdi’s sense of humor, such as privately mocking Caliph al-Mansur’s flashes of temper. Yet when it came to governing, she was all business: “At the opening of [her first son al-Hadi’s] caliphate, al-Khayzuran used to exercise her authority over him in all his affairs without consulting him at all ... assuming sole control over matters of ordaining and forbidding, just as she had done previously with his father,” al-Tabari remarks on al-Hadi’s accession upon al-Mahdi’s death in 785. The new caliph chafed at his mother’s dominance. Perhaps it was because al-Hadi didn’t live up to Khayzuran’s expectations, or perhaps he resented her long-standing preference for his younger brother, Harun al-Rashid. The discord did not last long: Al-Hadi died the following year. (Rumors circulated that Khayzuran had him poisoned, but there is no authoritative account.) 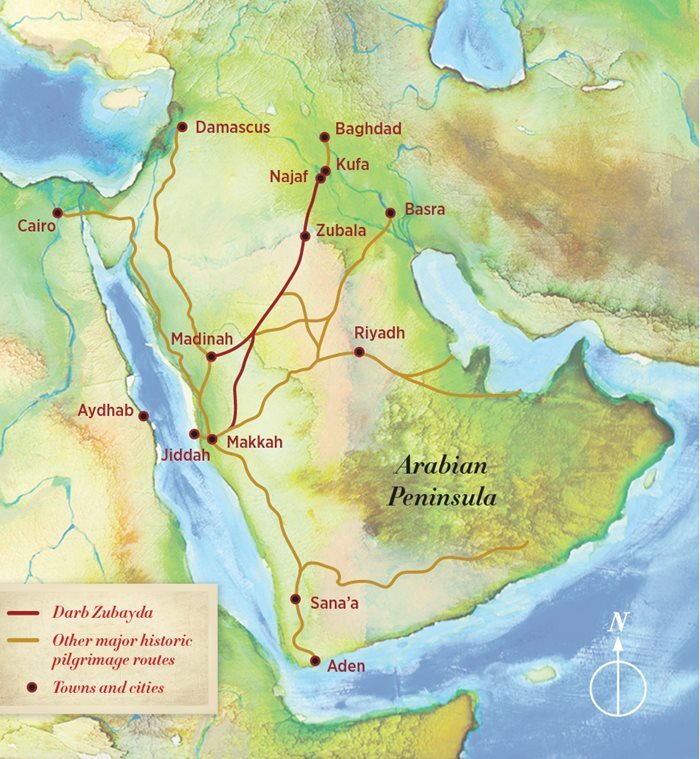 Harun al-Rashid became caliph of an empire from Morocco to Persia and ushered in the zenith of the Abbasid era. When his mother died in 789, the caliph displayed the depths of his grief and devotion by helping to shoulder her bier, barefoot, through the mud. The histories do not detail Khayzuran’s political achievements, but coins were struck in her name, palaces were named for her, and the cemetery in which subsequent Abbasid rulers were laid to rest also carried her name, all testifying not only to status but also to a civic largesse. Notably, she passed on this sense of civic duty to Amat al-Aziz, known to history by the unflattering if sonorous name Zubayda. Zubayda was both Khayzuran’s niece and, after Zubayda’s marriage to Harun al-Rashid, her daughter-in-law. It was her grandfather, al-Mansur, who no doubt intended affection in nicknaming her Zubayda (which means “Little Butter Ball”) “on account of her plumpness” as a child, according to 13th-century biographer Ibn Khalikhan. Born into the lap of the extreme luxury of the Abbasid Empire at its zenith, Zubayda quickly developed extravagant tastes. According to al-Zubayr’s 11th-century Book of Gifts and Rarities—a sort of “Lifestyles of the Rich and Famous” of its day—the cost of her wedding, “the likes of which had never ... been seen in [Islamic] times,” ran to 50 million dinars. (For comparison, the annual cost of living for an average family in Baghdad was about 240 dinars.) The event featured a waistcoat encrusted with rubies and pearls “whose value could not be assessed” for the bride; guests received gifts of gold dinars in silver bowls and silver dinars in golden bowls. A trendsetter of high style, Zubayda was “the first to introduce the fashion for slippers embroidered with precious stones and for candles made of ambergris—fashions which spread to the public,” according to al-Masudi. On state occasions, it was said, she “could scarcely walk under the weight of her jewelry and dresses,” and she had to be propped up by servants. She spent no less lavishly on public works, to her enduring renown. Yet she spent no less lavishly on public works, to her enduring renown. She made at least five pilgrimages to Makkah, as it was on her fifth, in 805, that she was distressed to see that drought had devastated the populace and reduced the sacred well of Zamzam to a mere trickle. She ordered that the well be deepened, and she spent nearly 2 million dinars improving the water supply of Makkah and the surrounding province. This included the construction of an aqueduct from the spring of Hunayn, 95 kilometers to the east, as well as the famed “Spring of Zubayda” on the plain of Arafat, one of the ritual locations on the Hajj. When her engineers cautioned her about the expense, never mind the technical difficulties, she replied that she was determined to carry out the work “were every stroke of a pickax to cost a dinar,” according to Ibn Khalikhan. In a personally painful decision, in 813 Zubayda put the interests of the state ahead of her own flesh and blood by ultimately endorsing her stepson al-Ma’mun’s accession to caliph when her own son, Caliph al-Amin, became intolerably corrupt. Her instincts were on the mark, and the cultured al-Ma’mun proved to be a just and erudite ruler who founded Baghdad’s famed think tank, bayt al-hikma (house of wisdom), which became a center for the translation into Arabic of Greek, Roman and other classical texts that not only informed the Abbasid intellectual milieu, but also later became foundations of the European Renaissance. Zubayda died in 831, yet her reputation as a woman of influence lived on in both history and literature. Her husband, Harun al-Rashid, became the protagonist caliph in the European collection of alf layla wa layla (1001 Nights), and it was Zubayda who became the real-life basis for the very fictional Scheherazade. Art direction for the “Malika” series: Ana Carreño Leyva; calligraphy: Soraya Syed; logo graphics: Mukhtar Sanders (www.inspiraldesign.com).